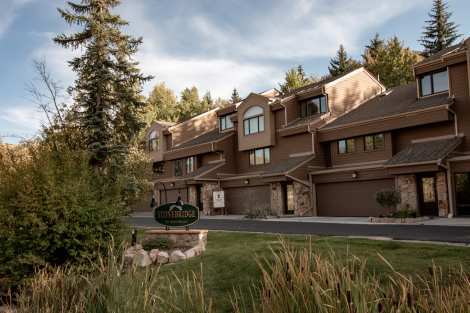 Resort Property Management offers a wide variety of Deer Valley Resort condominium rentals. 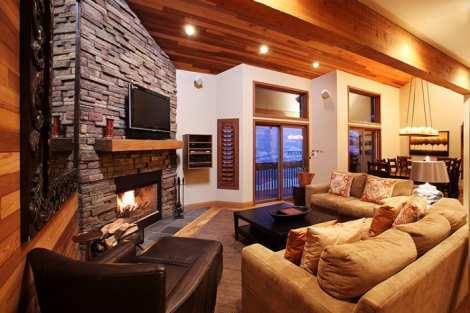 If you are looking for a luxury Deer Valley condo rental look no further. Deer Valley boasts some of the most unique, luxurious and amenity rich condominium accommodations in the Park City area. 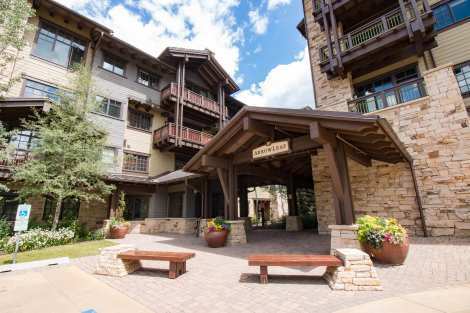 Whether you are looking for the privacy and prestige of Upper Deer Valley's Silver Lake Village or the location and convenience of Lower Deer Valley's Snow Park area Resort Property Management has the perfect Deer Valley condo for you. Browse our inventory of Deer Valley condo rentals below or give us a call at 1-800-645-4762 to speak with one of our local reservation specialists. 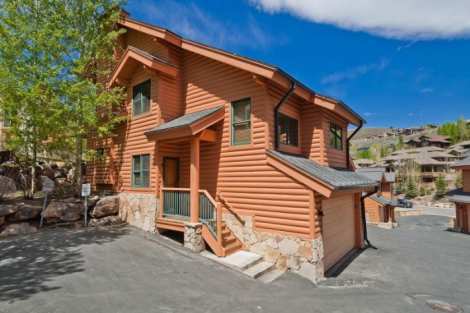 When location and luxury are both key factors in choosing your vacation rental in Park City, you’ll want to be sure to take a look at this lower Deer Valley location. Enjoy being just steps away from Main Street and the main transit center that offers free shuttle service throughout the Park City area. This unit is new and has been beautifully finished throughout. Lounge on custom furniture, whip up a gourmet meal in your well-appointed kitchen that includes granite counter tops and finishes the fussiest of chefs would appreciate. The master bedroom is a true retreat featuring its own private deck, jetted tub, private hot tub and mountain views.Spend a night in and relax in your very own theater room or nestle up next to one of the gas fireplaces for a cozy mountain evening. A heated drive garage can accommodate up to four vehicles, although many guests to Park City decide to take advantage of the free shuttle system instead of renting a car. The free shuttle transit center is just down the street from this property, and waling to Main Street takes only a few moments. This property offers ease of access to everything guests come to Park City topped with a luxury lodging experience. 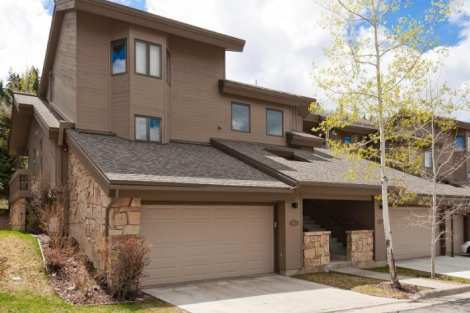 Deer Valley Stonebridge Condo Rental Located in the lower Deer Valley area, this lovely three bedroom, three bathroom home is conveniently located allowing access to Park City’s free shuttle route. Hop the shuttle and be whisked away to any resort or destination you desire in Park City. 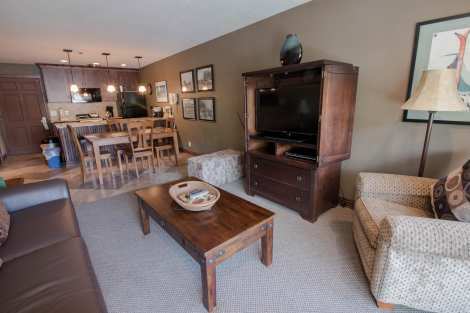 Tastefully decorated, guests will enjoy the downstairs recreation space that includes a large flat screen TV and pool table.A relaxing vacation is certainly a guarantee with access to high speed internet, multiple flat screen TV’s, a private outdoor hot tub and private two car garage. 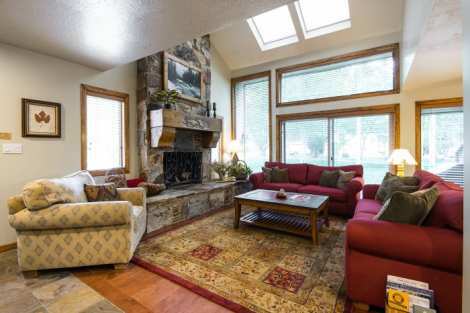 Vaulted ceilings offer a bright and cheerful ambiance throughout. Outside on the deck, guests are treated to a BBQ grill and fantastic views from this corner unit. Boot warmers are provided to keep ski gear warm and dry, and you’ll find these sorts of personal touches throughout this vacation home. 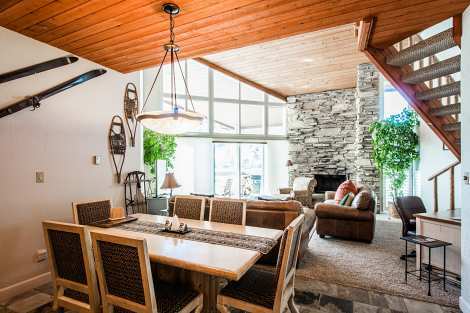 Deer Valley Queen Esther Condo for Rent Settle in to this three bedroom mountain contemporary and super cozy condominium located a short walk away to the Deer Valley Ski Resort and to Main Street in Park City. With access to the free shuttle bus, you’ll find a car isn’t necessary. 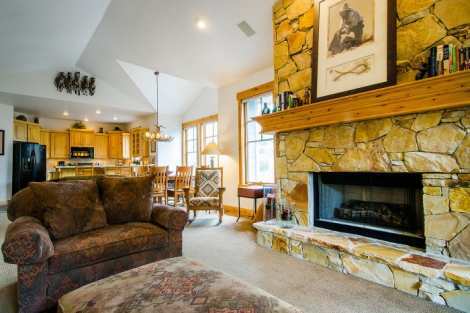 The welcoming family room has a gorgeous stone fireplace, perfect for snowy mountain nights. A large, well-appointed kitchen hosts an eat-in breakfast nook, granite countertops and high end appliances. Each master bedroom was designed with your comfort in mind with down comforters, custom paint and large bathrooms. One of the unique characteristics of this ski home is the indoor hot tub, surrounded by windows and mountain views. Also available for your entertainment you’ll find three flat screen TV’s, stereo system, streaming Netflix and wireless internet with a printer/ copier/fax available for your use. 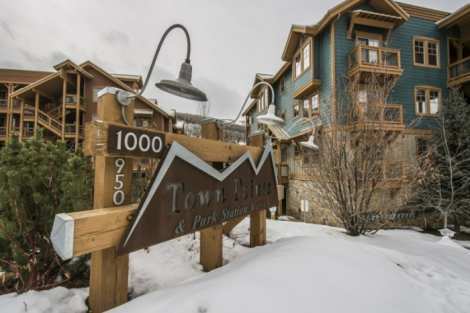 Beautifully furnished with a location that allows for easy access to all Park City has to offer, you’ll find this condominium has everything you’re looking for. For travellers looking for urban elegance paired with mountain luxury, this Lofts townhome delivers. Sprawl out in 3300 square feet of living space designed with both privacy and functionality in mind. Each floor boasts its own master suite with en suite bathroom and the kitchen and living spaces are also location their very own floors.A Chef’s dream, the kitchen is outfitted with Viking appliances, a one-of-a-kind stone stove enclosure, large dining bar and room to entertain. Head up to the rooftop and host an après mountain adventure soiree while grilling on your BBQ or enjoying a dip in the hot tub – an entertainers dream. Mountain contemporary architecture brings together rich wood accents with metal and modern finishes. The Lofts are truly a unique architectural feature in Park City, and an in-demand lodging location for those in the know. Walk to Main Street or hit the free city shuttle, just steps away, and take your adventure to anywhere you like in the Park City area. The location is one of the best in Park City with both Deer Valley and Park City Mountain resort only moments away. Offering upmarket slope-side accommodations, guests will delight in Arrow Leaf’s alpine location right in the heart of the desirable Empire Pass area at Deer Valley Resort. A truly spectacular three-bedroom residence, this property offers a state-of-the-art kitchen including top-end appliances; a Chef’s delight! The living space is cozy, chic and perfect for lounging after a day on the slopes of Deer Valley. Snuggle in next to the gas fireplace, flip on the stocked authentic bubbler jukebox and enjoy a family evening reminiscing about your perfect Park City vacation. The Master suite holds a bath retreat that includes separate shower, double sinks and radiant heat to keep your toes warm on chilly winter mornings. Then second and third bathrooms each have their own en suite bathrooms and both host queen-sized beds.Located on the same level in adjoining Arrow Leaf building A is the Arrow Leaf Hearth Room. Take advantage of this common area social space that includes a large fireplace, lounge area, pool table, darts, books, and a computer station that offers free WiFi access. Free WiFi is also available in your property. You’ll also find your private ski locker with boot warmers in the Hearth Room. Outside you’ll find the splendid outdoor gas fire pit and dual hot tubs – the perfect way to cap off your ski day! A covered heated secure parking garage is available on site should you choose to bring a car, although most guests to Park City find a car unnecessary. Spectacular doesn’t even begin to describe this Lakeside four bedroom Deer Valley luxury retreat. Located in one of the best areas of the Lakeside community right on the shores of one of the ponds, guests enjoy a serene and peaceful setting whatever the season. The perfect choice for two families traveling together, this home offers two master suites, a spacious guest room and a bunk room you’re younger guests will love. Enjoy evenings by the grand and contemporary stone fireplace, or pair up for a foosball tournament in the recreation space. 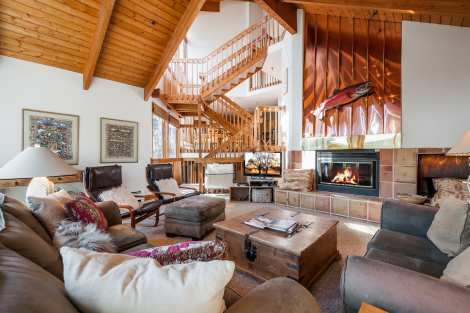 Location is one of the most sought after amenities for any ski home, and this property has it in spades. Only a half mile from the slopes of Deer Valley, 60 yards from the free Deer Valley Snow Park ski shuttle, and steps away from the free Park City shuttle service, guests have access to all of the Park City area at their doorstep. Cozy up next to the gas fireplace,, or take a stroll to the common area year-round pool and hot tub complex to relax and rejuvenate after a day of Park City adventures. Guests truly have everything they could possible ever desire in a home base for a memorable Park City holiday.Although a car isn’t needed with this location, and attached two car garage is offered for your car and gear storage. Truly magnificent only begins to describe the location and amenities offered in this ski in ski out Double Eagle unit located slope-side in heart of Deer Valley’s prestigious Silver Lake area. Take in the awe inspiring mountain views, high end furnishings and well thought through amenities including an entertainment system boasting a large flat screen TV for nights spent relaxing with you family or group. Sink in to the large comfy sectional in front of the wood burning fireplace with gas assist and relax after a day spent exploring Deer Valley. Framed by a cathedral ceiling, you’ll surely enjoy nights spent in lounging in this living space. Offering room for six guests, the dining room offers an elegant table to gather round with room for another four at the built in breakfast bar. Enjoy a soak in your own private hot tub at the end of the day and take in the gorgeous panoramic mountain views surrounding you.The bedrooms allow for ample guest accommodations and are decorated in a mountain luxe style true to the Deer Valley surroundings. Guests will find the master bedroom fitted with a king bed, large separate sitting area, cozy couch and entertainment system. The en suite bathroom comes equipped with a jetted tub and separate shower, double vanity and walk-in closet. The second bedroom has a king size bed and adjoining bathroom, similar to the third bedroom. If more space is needed, there are two murphy beds located in the lower level family room. Located on the free shuttle route, a car is not necessary, however covered parking is available. 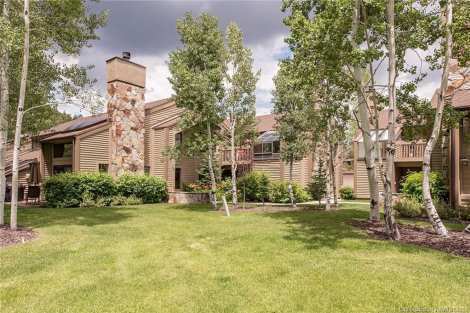 Queen Esther Village is located in a beautifully landscaped park-like setting in Lower Deer Valley close to Snow Park Lodge's winter skiing and summer hiking and concerts. This tasteful and impeccable town home features a desirable layout with great room and bedrooms all on the same level. The great room enjoys vaulted ceilings and stone fireplace as well as a beautifully updated kitchen with custom cabinetry with lighting, granite counter tops, tiled back splash and a delightful breakfast bar. The baths are updated as well with granite, stone and tile finishes. A convenient mud room between the main entry and garage has plenty of storage for all your recreational gear. The 2 car garage also benefits from a storage room and workshop area. From the south facing deck and the private hot tub room enjoy the great wintertime ski area views and summertime treed privacy. 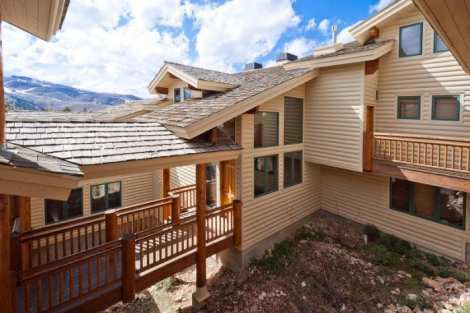 Located in the desirable lower Deer Valley area, this property offers the best of everything. Enjoy easy access to Historic Main Street District, the free shuttle system main station, as well as only moments away from Deer Valley and Park City Mountain Ski Resorts. Boasting room to sleep up to 12 guests, and located adjacent to our Deer Valley Drive 5-bedroom A property, this is the perfect spot for large groups looking for a luxurious Park City getaway. Newly constructed, no detail has been left to chance.Guests will relish the attention to the finishes including hardwood floors, granite countertops, gourmet kitchen and custom furnishings throughout. The master includes an en suite bathroom with jetted tub and a private deck with hot tub. The in-property theater room is perfect for cozy nights as is the gas fireplace located in the main living area. Room for your car in the 2-car garage with heated driveway, or enjoy easy access to the free transit system and walkability of lower Deer Valley where everything is just out your front door. Lakeside townhomes are known for their spacious and open floor plans, convenient Deer Valley location, and beautifully appointed interiors. This townhome was recently remodelled to include granite countertops and stainless appliances in the kitchen area creating the perfect setting for an evening in or a visit from a private chef to create a culinary experience for a special occasion. Relax in front of the gas igniting wood burning fireplace or enjoy a dip in the common area heated pool and hot tubs just 15 yards from your front door. Revel in the peaceful setting located just a half a mile from Deer Valley ski resort and Snow Park Lodge.Also nearby is Park City’s Historic Main Street. Hop the free city shuttle located just steps away from the townhome and be to Park City’s shopping, dining and nightlife within a few short moments. Also nearby is Park City Mountain Resort making access to two world-class ski resorts as easy as can be. Should you choose to bring a car, an attached two car garage is available to keep your car snow-free in the winter months. Just 60 yards away, a quick walk, will bring you to the Snow Park parking area where you can hop on a free Deer Valley shuttle and enjoy a free ride to the base of Deer Valley Resort in the winter months. This Lakeside townhome has been thoughtfully designed to offer a warm and welcoming resort ambiance surrounding you with lovely finishes and a mountain contemporary feel. 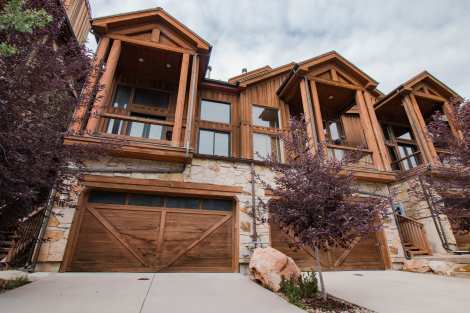 Mountain charm radiates from this Foxglove town home located on Deer Valley Drive, a direct link to Deer Valley resort and Park City’s historic Main Street. A cozy, updated interior welcomes you home complete with two stone gas fireplaces, a lovely updated kitchen with granite counter tops, and a warm welcoming living space. An attached garage makes it easy to bring your car, but the location on the Park City free shuttle route makes it unnecessary to do so. This end unit offers privacy and quiet, perfect for nights soaking in your own personal hot tub. 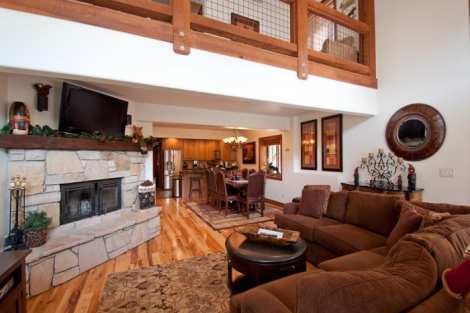 Ski Trip Deer Valley Condo Rental A beautiful sunny picturesque view of skiers riding down the slopes at Deer Valley awaits you . 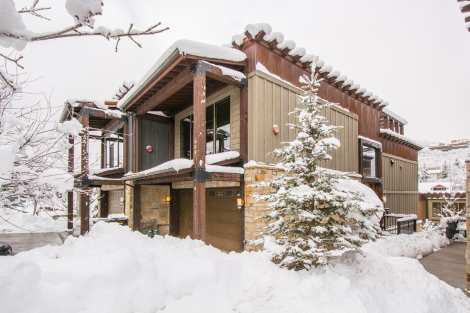 This beautifully appointed Powder Run residence is perched right over the base area at Deer Valley’s Snow Park Lodge with the most desirable views of the slopes from your private hot tub or large living room window . This Deer Valley residence remodeled in 2015 now offers a fashionable high end kitchen with Wolff appliances, custom cabinetry and back splash, new flat screen TV’s and an inviting cozy family room with vaulted ceilings and a loft above with added lodging accommodations. Two Queen master bedrooms feel open and large with tall ceilings and en suite baths, and the loft with three additional twin beds is a great place for additional guests to relax. Ski storage lockers in the building allow for convenient storage in addition to lockers offered at Deer Valley, underground convenient parking with an elevator to your door, and a two minute walk to the lodge and ski school make this truly the most highly sought after lodging location in Deer Valley. 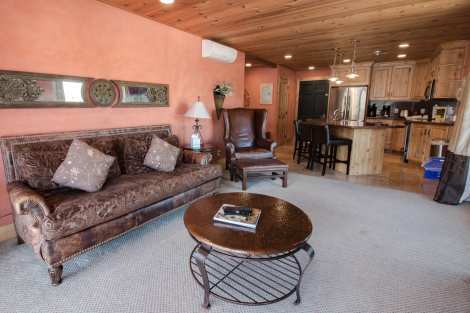 This Deer Valley gem will accommodate you and all your friends and extended family! Nestled in the heart of lower Deer Valley this 4 bedroom, 4bath condo features an expansive open floor plan with over 3700 sq. ft. Equipped with vaulted ceilings in the great room, a cozy fireplace, private deck with hot tub, full laundry/utility room and a 1 car garage with additional 2 off street parking spots. A perfect property for a large or multi families with 3 king suites and a kids room with a queen bed, twin over twin bunk and 2 additional twins- sleeping a total of 12 people. This multi level townhome has multiple living spaces as well as a billards area. A short 10-minute walk to Historic Main Street and/or easy access to the free Park City bus system makes any seasonal adventure within reach. This property also come with full access to the Deer Valley Skiers complimentary shuttle. If you are looking for affordable lodging in a convenient location - look no further! Overall Great Location and nice property. Only complaint is the amount of hot water available. Not enough hot water for 6 people to take a shower in the morning (not even a quick one each).